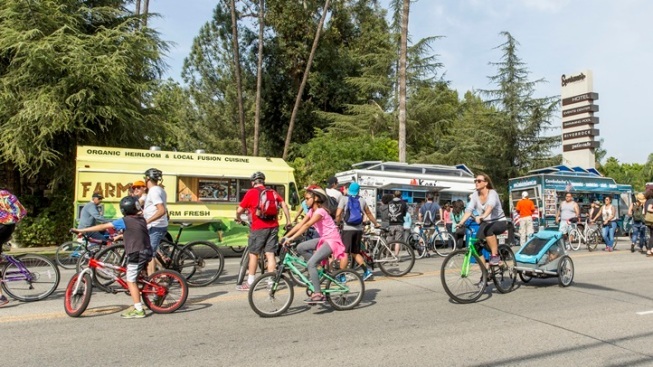 Join thousands of cyclists as they pedal along Van Nuys. Grab your bike and roll for the San Fernando Valley on Sunday, March 6. CicLAvia will toodle between Pacoima and Panorama City. Is it free? You got it. CicLAvia + Pacoima: If you joined the happy throngs of cyclists at the mega bike roll in the spring of 2015, you pedaled or pedestrian'd along Lankershim Boulevard. The mondo happening, which started in LA back in 2010, is revisiting the San Fernando Valley on Sunday, March 6, but in a different stretch, a four-miler that threads from Pacoima to Panorama City. Community booths, live entertainment, food trucks, and a host of throw-down-the-kickstand stops'll festoon the route. It's free as always, and a fine way to hobnob with other SoCalers and see some fresh sights from behind your handlebars. Fun bonus: Actor Danny Trejo will be at the let's-get-this-started morning ceremony. Los Angeles Lantern Festival 2016: That moment when day slides on into night, when the blue of the sky meets the pink of the setting sun, is an ethereal one. The annual free celebration at El Pueblo Historical Monument is much about that moment, and the lanterns lighting it, but a full under-the-sun day of creative doings awaits on Saturday, March 5. Magic shows, K-Pop dance performances, shadow puppets, martial arts, singing, and the sweetness of saying farewell to the many Lunar New Year parties that dotted the calendar combine to make a memorable day. Egg-stravaganza: The Hidden Mickeys of Disneyland Resort? You've found them all, or think you have. But your love of searching around the nook-and-crannied theme park hasn't dissipated. What to do? Buy at map -- it's a pinch under six bucks -- during your visit to Disneyland and Disneyland California Adventure and keep an eye out for "character" eggs. Note on your map where you found them and hooray: You'll receive a surprise. It's on through Easter, which is Sunday, March 27. And hang tight, lovers of Luigi from "Cars": His new attraction, Luigi's Rollickin' Roadsters, debuts on Monday, March 7. DINING OUT AND HAPPY HOURS: It's a big confluence when a food-themed Restaurant Week and a beverage-centered Happy Hour Week pop up within one region, but that's just what is happening over the coming days. Dine Out Long Beach, which puts the spotlight on local eateries (as well as "value-oriented prix fixe meals"), is on through March 5. Happy Hour Week in Old Pasadena summons sip-nice specials and walks around the historic quarter through March 14.